This gorgeous little tented camp with just 3 stunning rooms is one of the undiscovered gems of the Eastern Cape – a stylish and romantic bush escape! We love the stylish revamp that HillsNek has enjoyed – this has to rank as one of the most attractive little lodges in the country! We’re not sure which aspect we like more about the stylish tents: the way that they are so open and airy courtesy of the roll-up blinds; or is it the romantic and rustic outdoor showers! Just 3 tented rooms means that it can sometimes be tough to find space here, especially if you’re wanting more than 1 room – that said it’s also a wonderful option for a small group of family or friends to hire on an exclusive basis! 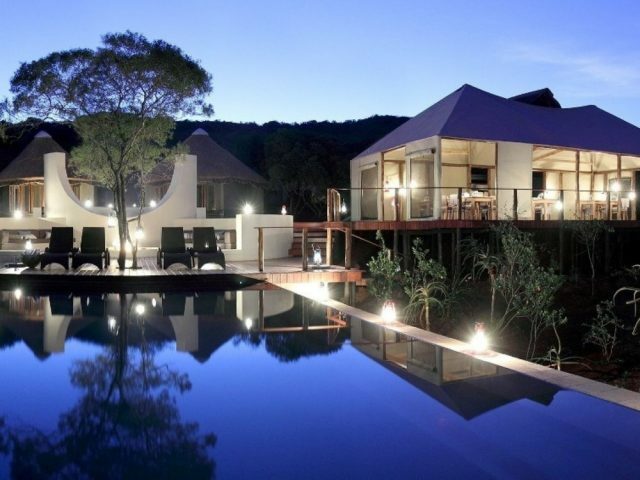 this tented camp has undergone a recent and very sophisticated refurbishment, creating an inspiring and fresh new look – in fact they have to rate as some of the nicest tented rooms of any lodge in South Africa! 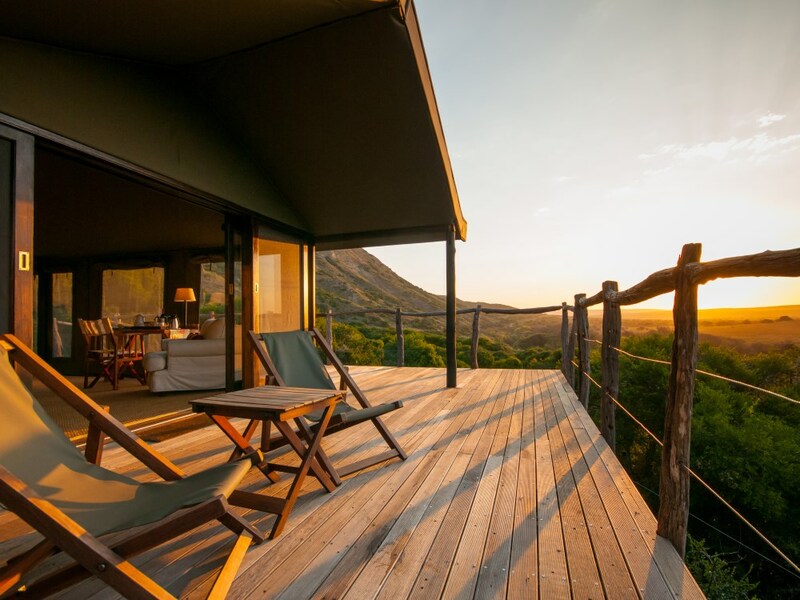 Nestling on the banks of the Bushman’s River with breathtaking vistas of rolling plains of the Amakhala reserve lies perhaps the most charming and stylish little lodge in the entire Eastern Cape – the 3 gorgeous tents that make up HillsNek Safaris! 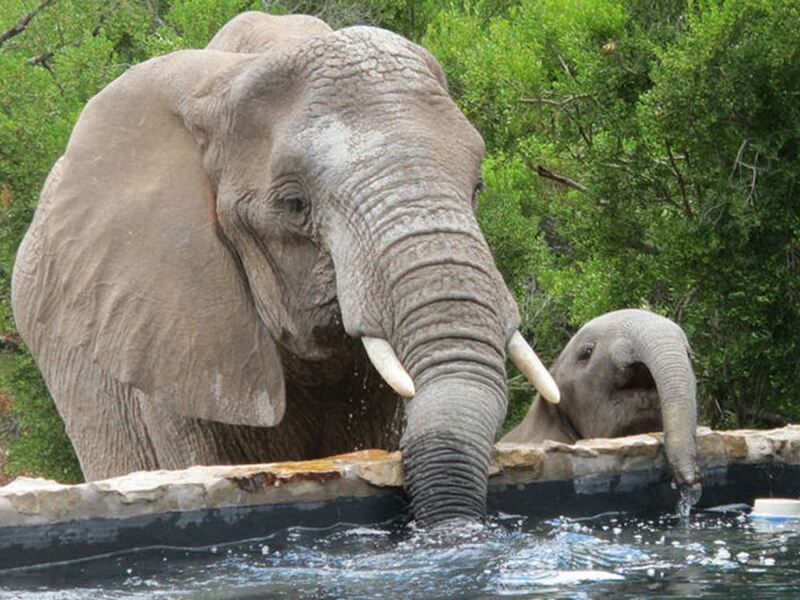 Located on the far eastern border of the Amakhala Game Reserve (conveniently located just 70 Km outside Port Elizabeth - bordering Shamwari Game Reserve and Addo), HillsNek Safaris is an intimate family-run lodge. As you can imagine, with just 3 rooms, this is a lodge where privacy, warm hospitality and personalized attention is the hallmark of every stay. As you can imagine, it’s ideal for a small group of family or friends and can be rented out on an exclusive-use basis on request. 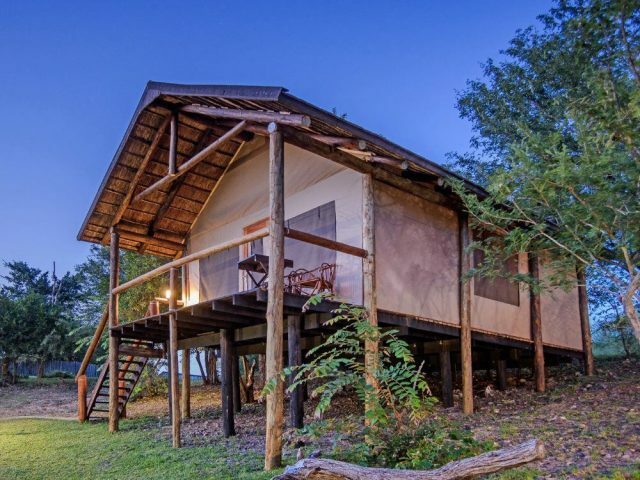 The main lodge and three luxury tented chalets of HillsNek are elevated on expansive wooden decks that command panoramic views of the open plains below. This tented camp has undergone a recent and very sophisticated refurbishment, creating an inspiring and fresh new look – in fact they have to rate as some of the nicest tented rooms of any lodge in South Africa! The redesign and redecoration of the lodge was handled by owners Brent and Chantelle Cook and they’ve done a fantastic job! The safari tents have been completely reimagined whilst still retaining the essential integrity and special ambience of the camp. A fresher African safari feel has been introduced using a clever fusion of natural colours from tranquil off-whites through to dark chocolates, with contrasts of bright African shades such as lime and burnt orange – your jaw can’t help but drop when you walk into these tented suites! 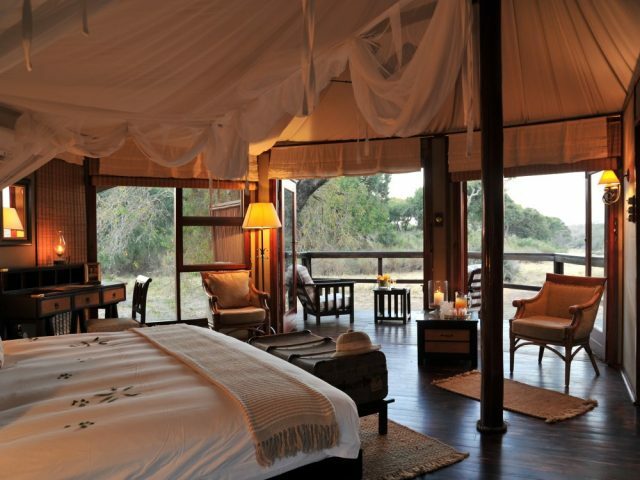 The tents are all very discreetly positioned to ensure privacy and tranquillity and are linked to the main lodge by raised wooden walkways. Inside they’re spacious, well equipped and wonderfully airy, with large roll-up canvas blinds that succeed in opening up the tent to the stunning views of the surrounding bush which you can even enjoy from the comfort of your oversized king bed! Whilst the tents inevitably hark back to the nostalgia and romance of the safaris of yester year, they’re also bang-up-to-date feeling courtesy of stylish oversized black and white wildlife prints as well as use of colourful throws and cushions. A highlight for us has to be the en-suite bathroom complete with deep tub and romantic ‘wash in the wild' rustic outside shower - here you can soap up whilst simultaneously soaking up the uninterrupted sprawling vistas under the heat of the African sun. Whilst the warm water cascades down on you, sun birds flit about the surrounding foliage and lizards bask on the sunny deck! It’s not just the tented rooms that impress though. The main lodge area has undergone the same stylish transformation whilst retaining the open design that engages the senses with its outside-in feel and gives the impression of a tangible connection to its spectacular surroundings. It’s all very natural and organic in feel, with stone, canvas and thatch utilised to make up the stylish open plan lounge, bar and dining-room with decks overlooking the surrounding vegetation. But what we perhaps love most is that the entire canvas front of the lodge can be opened up to best enjoy the surrounding landscape and to let the cool air flow in on those hot summer days! The solar heated stone swimming pool sits front and centre on the main deck offering you another place to relax and watch the wildlife casually traversing the nearby plains whilst taking refuge from the heat of the day! The lodge sets a spectacular stage for viewing unforgettable African sunsets followed by pleasant evenings sitting around a copper bowl fireplace under the stars with the Milky Way seemingly almost at your fingertips – not to mention the perfect setting to tuck into some delicious bush cuisine whilst chatting with fellow guests. But in some ways what excites us most is actually the prospect of just chilling at this characterful and charming little lodge – it really is the perfect place to simply let the bush work its special magic on you in a romantic, tranquil and soulful atmosphere. A perfect escape from the reality of modern life!